Nothing signals spring like the first bulbs coming into bloom. Snowdrops and the little reticulata irises start flowering in winter, followed by crocuses and other treasures. Some, like lachenalias and babianas, are happiest in warmer parts of New Zealand, while others – including snowdrops and tulips – do best further south. To get the best results, bulbs should be planted from February to April to ensure the winter chilling they need to produce good flowers. If you live in an area where winters are mild, it pays to put bulbs in a paper bag (never plastic) in the fridge for at least a month before planting. They are deluded into thinking they have experienced winter and should flower well as a result. Most bulbs are not fond of lime, although tulips are an exception. Even those that are happy in a damp situation, such as fritillarias, need good drainage to prevent the bulbs rotting. An annual feed of bonemeal or blood and bone helps keep them going strong. For an ongoing display of different types, select early (July-August), mid-season (September-mid-October) and late-season (mid-October-November) varieties that grow to less than 15cm (small), those 15-50cm (medium) and over 50cm (tall). 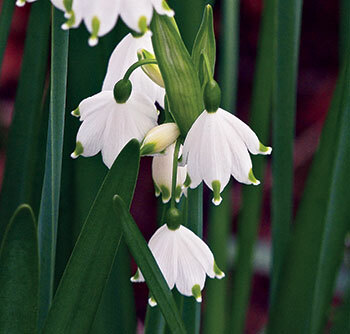 Snowflakes (Leucojum) are better for warm areas than snowdrops. Snowdrops (Galanthus) are among the first harbingers of spring, able to push above snow their little white flowers with distinctive green stripes. Because they need cool conditions to do well, they are not recommended for Auckland and Northland, although snowflakes (Leucojum) will thrive. Iris reticulata flowers in late July on 10cm stems. Flowers are usually blue (‘Gordon’, ‘Cantab’) or purple (‘Purple Gem’, ‘Pauline’) and occasionally white (‘Natascha’). The yellow reticula type, I. danfordiae, is much more difficult to grow but worth the effort in areas with dry summers. When buying bulbous irises, check there are no black spots on them, as it indicates disease. Crocuses are considered one of the gems among spring bulbs. They can be grown in containers, rock gardens, borders and under deciduous trees. Grape hyacinths (Muscari armeniacum) are probably the easiest bulbs to grow. They come in blue shades and quickly form dense patches if left undisturbed. Whites are less prolific, although ‘White Magic’ is reportedly stronger growing. Freesia species and hybrids are suitable for containers, rock gardens and in the front of gardens close to paths. The colour range is wide and New Zealand-raised ‘Burtonii’ is still one of the best creams. Other colours include pink, yellow and blue in single and double varieties. Muscari comosum‘Plumosum’is the tallest grape hyacinth with feathery flowers on 30cm stems. Hyacinth orientalis is the most important of the three species of hyacinths because it has been used to breed the hundreds of highly perfumed cultivars so popular with gardeners. Outdoors, they do best in a sunny spot with free-draining sandy soil. The big bulbs usually available have been “forced” to produce large flowers in the first season but often fail to do well the following year. Babiana are South African natives, known as baboon flowers. Lavender-blue shades are the most familiar but there are also red and yellow species. They all thrive in warm climates and the corms should be left undisturbed unless they become too crowded. yellow, red and green on each flower. Somewhat more tender are the pretty lavender variety, ‘Rupert’ and pure yellow ‘Ronina’. Bluebells (Hyacinthoides non-scripta) and (H. hispanica) are European woodland bulbs, ideal for naturalising under trees, where they will spread rapidly. As well as the common blues, there are pink and white forms and doubles are occasionally available. Crown imperial lily (Fritillaria imperialis) is not a lily but among the tallest of the 100 or so Fritillaria species. It comes from the Himalayas, has yellow or orange flowers and the foliage has a distinctive, rather unpleasant, smell. It tolerates a wide range of conditions but is best in cool soil in partial shade. Hippeastrums flower from late winter and there is a splendid range of cultivars, mainly in white, pink and red, many of them striped. They are usually grown as pot plants but will grow outdoors in warm areas if they can be kept dry over winter. H. papilio, with maroon and green markings on the cream flowers, blooms later, usually in September. Anemones (Anemone coronaria) are excellent cut flowers. The De Caen series was developed to offer larger, single blooms, while the St Brigid series has double flowers. Colours are blue, white, pink and red. The odd-shaped tubers are planted flat side up in well-drained soil. A. coronaria can also be grown from seed. Sparaxis have showy, star-shaped flowers and are very easy to grow, especially S. tricolor, sometimes called the harlequin flower, as it has a yellow throat, dark central zone and bright orange, purple or pink petals. Ranunculus seem to have fallen from favour, a pity because not only do they look good in the garden but are excellent cut flowers. Colours are white, cream, pink, yellow, orange and red. They are prone to mildew in humid conditions and do best in drier areas. Plant the tubers ("claws") with the points facing downwards. Both Anemobes and Ranunculucs can be planted early and mid season if desired. Dutch irises are hybrids of Moroccan Iris tingitana and Spanish I. xiphium. Numerous varieties are offered in white, yellow, blue and purple. The similar-looking English iris (actually a Spanish native, I. latifolia) flowers later, usually from about mid-December. Ixias or corn lilies are South African natives of which the best known is I. viridiflora with blue-green flowers on wiry 90cm stems in late spring. Other species are red, white, yellow and orange. Tulips grow and multiply splendidly in southern New Zealand but because of their need for winter chilling and hatred of humid summers, can be an exercise in frustration for northern gardeners. There are more than 100 species plus 15 divisions of cultivated varieties, most of which were developed from Tulipa gesneriana. A show specimen of ‘Aisling’. We’ve been hooked on narcissi – commonly called daffodils – for centuries. Some people talk of the “Daffy-down-dilly”, which originates from a children’s story, Little Daffydowndilly, by American author Nathaniel Hawthorne (18041864), while others refer to them as jonquils. Whatever you call them, gardeners are faced with tens of thousands of cultivars to choose from, so the problem is where to start. The colour range is fairly simple – white, all shades of yellow, pink, orange and reddish orange – but the way they combine has produced innumerable varieties, short and tall, single and double or split corona, where the central cup (the trumpet or corona) is split for at least half its length, producing an open blossom, instead of the typical trumpet. 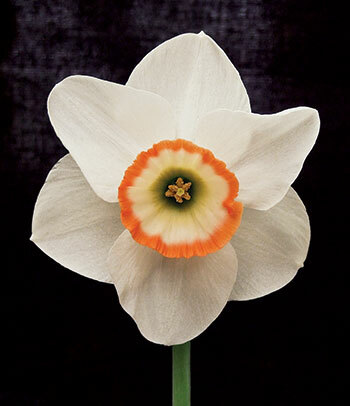 Experts disagree on how many narcissus species there are – from 26 to 60 – arguing whether some are natural hybrids. However, all agree that they can be tricky subjects for warm climates, where double varieties seem particularly liable to buds drying up before opening. In their book, Bulbs for New Zealand Gardeners & Collectors, Jack Hobbs and Terry Hatch recommend for warm areas cultivars of Narcissus bulbicodium (hoop petticoats), N, cyclamineus (‘Jack Snipe’ for example), N. jonquilla (‘Sundial’), N. tarzetta (‘Soleil d’Or’ and ‘Erlicheer’ are the most familiar) and N. triandrus (‘Hawera’). The old hybrid ‘Thalia’ is also well-suited to warmer areas. All narcissi do best in lime-free soil to which blood and bone is added at planting time. They have a short resting period, sending out new roots long before shoots appear above the soil. Planting can be done from now until late autumn. When flowering is over, leave the foliage for as long as it is green before trimming it back as it is contributing to the build-up of next year’s flowers. Tying the leaves in bundles with a strip of flax helps keep the plants neat and dead leaves are eventually easily removed. The main pest is the narcissus fly, which lays its eggs in November after daffodils have flowered. When the grubs hatch, they burrow down into the bulb, where they grow to resemble fat maggots and destroy the centre of the bulb, which dies. Miniature varieties are rarely attacked. Covering the base of the foliage after flowering will solve the problem. Pea straw, hessian or fine-mesh netting works well, or a dry mulch, such as spent oat husks or hops if you can get them, also stops the flies laying their eggs.